But I’m a man. It’s expected for a knuckle-dragger like me to say things like that. Women, Ms. Swift argues, should be above that. 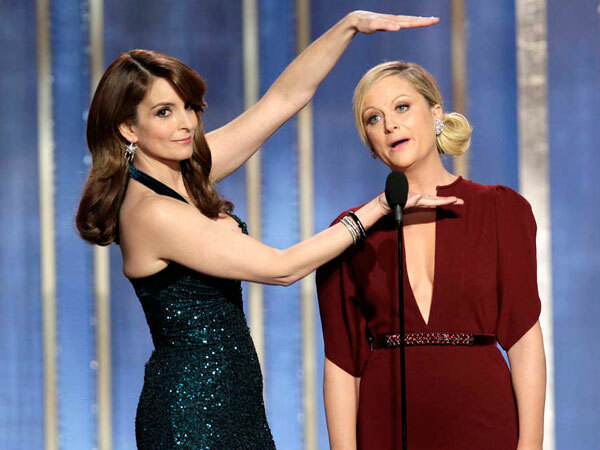 Women like, say, feminist beacons Tina Fey and Amy Poehler. Before this gets any further: yes, I’m aware of the shaky ground I stand on as a man writing about women’s issues. But if you’re really the open-minded sort who believes in gender equality, you’ll hear me out even though I’ve got dangly bits. In an interview with Vanity Fair, Swift remarked, "You know, Katie Couric is one of my favorite people, because she said to me she had heard a quote that she loved that said, ‘There's a special place in Hell for women who don't help other women.'" Yes, that was just a quote of Taylor Swift quoting someone who was quoting someone else. Someone call Christopher Nolan. She was referring to a bit the two comedians did at the Golden Globes at her expense, riffing along much the same lines as the rest of pop culture. The media picked it up and ran with it, blowing it all up into something far bigger than it should be. Just by mentioning it here, I know I’m adding to the problem. I’d rather examine the attitudes that caused her to strike back, though, than what she actually said. Somehow, Swift seems to thinks she’s been victimized by two toadies of the patriarchy (who have, incidentally, almost single-handedly demolished the myth that women aren’t funny in recent years). But comedy, like all other art, is best when it’s honest, and honesty dictates that the two of them observe a pattern and comment upon it. If Fey and Poehler had refrained from joking about her romantic past, it wouldn’t do a single thing to help women. In fact, by putting a comedic no-fly zone around women and their troubles, it’d only widen that particular gender gap. In order for both genders to be truly equal, they need to be accorded equal amounts of respect. That much is beyond question. But that also means they need to be afforded the same vulnerabilities. Fey and Poehler know this; their bodies of work have demonstrated that principle for decades. The simple fact is, if there were a male singer-songwriter whose only creative ouvre was throwing his ex-girlfriends under the bus in public, we’d think that man was a scumbag. And if comedians made jokes about him, he’d be expected to just man up and deal with it. So if we take the facts of this case and examine the different treatments of each gender, the question emerges: why is there a difference in the treatment at all? Because Taylor Swift wants there to be. Let’s compare her career to that of her inferno-bound tormentors. Since the word go, Swift’s played up the victim aspect of her persona. She’s forever beset by disappointing boyfriends, goats, or some combination thereof, and none of it is her fault. Tina Fey and Amy Poehler, on the other hand, have never shied away from making themselves look like the problem in their various projects. One approach has honesty, and the other lacks it. So which rings truer to life: the version where people occasionally screw up, regardless of their gender, and become better people by working through their problems? Or the version where girls are perfect little angels under constant attack from barbaric boys? Unfortunately, the word of Swift-via-Kouric-via-someone-else is clear on this issue: Fey and Poehler will descend straight to the Ninth Circle, where the jaws of Cerberus will rend at their flesh until the end of existence. Swift will continue to expose the world’s Y chromosomes as the utter Huns that they are, a courageous and fragile soul every step of the way. And, as ever, there will be goats. 1) "...who don't help other women." Taylor. You're a young, successful, idolized millionaire. Not an oppressed middle eastern housewife. What kind of help do you need. 2) There is NO reason that feminism should even be a part of this issue. They didn't make fun of you because THEY'RE women. They didn't make fun of you because YOU'RE a woman. They made fun of you because of the choices you, a PERSON, have voluntarily made using the INFINITE SUPPLY of personal agency wielded by somebody who is a young, attractive, talented, admired, American, wealthy HUMAN BEING. I just considered the possibility of this situation being remarked upon in the same breath as Kanye West at the 2009 Grammys. Great. Now I'm irritated by hypothetical circumstances.